Commonly thought of as one of London’s most fashionable but least touristy areas, the often expensive but always classy Marylebone is packed with hidden gems. Whether it’s the Wallace Collection of French Art (that you won’t see anywhere else as it never goes on loan) to some of London’s most trendy restaurants in the evening, you won’t be short of things to get your teeth into. Whilst the Wallace Collection is an amazing sight to behold and offers free entry, it’s been pipped to the post for our one must-do activity by Cabbages & Frocks, a clothing market in the grounds of St Marylebone Parish Church on the high street, offering food of a gourmet level at affordable prices, as well as vintage and modern clothing from the world’s most reputable designers and newcomers to the fashion industry. It’s open from 11:00-17:00 on Saturdays. Aside from the Wallace Collection and Cabbages & Frocks, there’s also the Vieux Comptoir on Moxon Street, a tea house that specialises in “les delices de France” – so cheeses, wines, plates of cured meats, patés and the like. While a little pricey if you want to buy in bulk, just grabbing a coffee and a mouth-watering snack won’t set you back too much. There’s also the Farmers Market on Sundays, as well as a relaxing selection of squares to walk around, sit and read in with your gourmet cappuccino, and a wide range of boutique shops, bars and restaurants for once the night starts drawing in. With so much to do in such a small area, you might want to find a bed in the locality to ensure that you have enough time to do it all. Fortunately, we have a great selection of budget and cheap hotels and B&Bs in the area, so make sure you get yourself a great deal by using our Marylebone booking service, and check out our itinerary of recommended attractions below. This is stunning Regent’s Park. It spans 410 acres and has rose gardens with more than 30,000 roses of 400 varieties. The park is the largest outdoor sports area in London with 'The Hub' housing a community sports pavilion and sports pitches (there’s nearly 100 acres available for sports fans of all abilities). You’re now at London Zoo! Here you can find out about over 600 species of animals, including lions, tigers, primates, giraffes. A day at London Zoo offers the ultimate back-to-nature experience and supports the conservation of many amazing species. This is Madame Tussauds – the world famous waxwork museum. You’ll find all your favourite celebs here and there are special exhibitions that run throughout the year. No trip to London is complete without a visit here! Sherlock Holmes and Doctor Watson lived in this Victorian lodging house at 221b Baker Street between 1881-1904 (according to the stories written by Sir Arthur Conan Doyle!). The house was built in 1815 and is listed by the Government to protect its architectural and cultural heritage. It is now open as museum dedicated to the life and times of Sherlock Holmes. The interior is exactly as described in Conan Doyle’s fantastic stories. You’re now on Marylebone High Street which has lots of small, independent shops as well as some well-known names. You’ll find the Sir Terence Conran shop here, set in converted stables and providing all that you could want in designer homeware. Why not visit the Conran restaurant ‘The Orrery’ which is upstairs in the same building? It’s known as one of the best Conran restaurants in town! This historic town house houses a national museum called The Wallace Collection. There are 25 galleries with amazing displays of French 18th century painting, furniture and porcelain. It’s also got an array of Old Master paintings and a world class armoury. This is Wigmore Hall - one the world's most important recital venues. It has about 400 events a year, including song, early music, chamber music and jazz. Wigmore Hall holds a unique place in London musical life and over the years it’s been a platform for the world's most sought-after musicians. Oxford Street was originally the final journey of prisoners from Newgate Prison to be executed at the Tyburn gallows (the site on which Marble Arch now stands). Oxford Street was the main route in and out of London for a long time and was known as Tyburn road, after the river Tyburn which lies to the south. 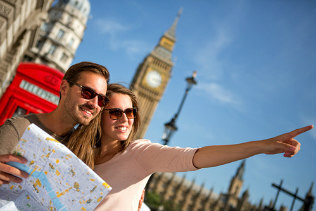 Oxford Street is undoubtedly London’s top location for shopping, with huge stores like Selfridges and John Lewis. It’s a must if you fancy some retail therapy, but be prepared for chaos on a Saturday! Here you’ll find Marble Arch. It was designed by John Nash in 1928 and originally formed the main gateway to Buckingham Palace. When Queen Victoria and Prince Albert decided to enlarge the palace in 1851 it was moved here as an entrance to Hyde Park. You’re now in stunning Hyde Park. It was acquired by Henry VIII in 1536 for its excellent hunting. Now it’s famous for boating and swimming in the The Serpentine, orators addressing the public at Speaker's Corner, and the beautiful Diana, Princess of Wales Memorial Fountain. Some of the Romantic poet John Keats' greatest odes were written here at Keats House. Although he spent just two years of his life here, the house contains displays of his letters, manuscripts, books and furniture. The garden has a plum tree planted on the site where Keats heard the songbird and wrote Ode to a Nightingale. He also wrote lots of passionate letters to his fiancée, Fanny Brawne, which is surprising because she lived just next door! This is the Regent Street campus of the University of Westminster, which was founded in 1838 and was Britain’s first Polytechnic college. Europe’s first photographic studio was opened here and the University of Westminster held the very first public displays of moving images. In 1874 The Criterion Theatre opened and was completely underground in this listed building. The Criterion is now also the site of the celebrated Criterion Restaurant. The spectacular tiles and mosaics of Thomas Verity’s original design have been fully restored and incorporated into the restaurant’s design. You’re now at The London Palladium. It’s a grade II listed building that was built by Frank Matcham (the architect responsible for the London Coliseum) in 1910. During the early years the London Palladium was a premier venue for variety performances. During the 1960s the famous Judy Garland and Liza Minnelli concert was televised live from the London Palladium. The London Palladium has also hosted the Laurence Olivier awards ceremony. This exclusive department store was established in 1707 by William Fortnum and Hugh Mason. Its fame rests almost entirely on its upmarket food hall (selling the finest luxury goods to those who can afford it). It also has a celebrated tea shop and Britain's only hair salon dedicated to long hair! In the grounds of St Marylebone Parish is the Cabbages & Frocks market, founded by the creators of the London Fashion Designer Sales. Running on selected Sundays, the market offers fine food and haute couture fashion from independent designers and artisans. Founded principally as a wine shop, this dedicated Marylebone Village venue branched out to include cheeses, meats, seafood, foie gras and gourmet teas and coffees. Le Vieux Comptoir also have tables for you to eat in and get yourself a delicious hot drink and a delectable bite to eat. Another institution of the Marylebone Village is the Farmers’ Market, which sees between 30 and 40 stalls providing the daily sustenance of Marylebone locals. And while it may be a little dearer than your local supermarket, the quality is high and the produce varied.